After releasing Nokia 5800 Xpress music, Nokia is set to launch Nokia N97, another addition to Nokia touch family and NSeries mobile devices. 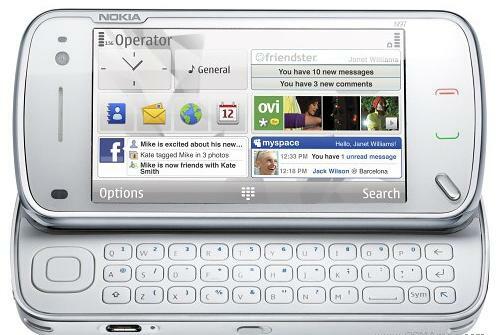 Nokia N97 uses the same Symbian S60 V5 OS with numerous upgrades and improved features. There was a difficult in finding out the suitable application for S60 V5 after the initial launch, for few months. All those themes and software supported by Nokia 5800 Xpress music will be usable with Nokia N97. From what I identified, Nokia 97 adapts its design from Nokia NSeries and Eseries. N97 has a full QWERTY slide out keyboard which is usually found in Eseries devices. All other features are similar to Nokia N95, N96 models. Nokia OVI store integration would help N97 users to buy /download applications directly on their phone. Initial launch price of Nokia N97 will be around 750 $. Nokia N97 will have a software interface and features similar to Nokia 5800 Xpress music as it uses the same OS, S60 V5. 5 megapixel camera with Carl Zeiss Tessar lens and dual LED flash. The memory of the N97 is Expandable up-to 16GB and there is an inbuilt 32GB flash memory. The device has GPS functionality that when used with Nokia Ovi maps will become an excellent navigation aid. The full QWERTY keypad and social media enhanced home screen UI are other plus points. Nokia N97 price in 2011-2012. The latest price of Nokia N97 is 28000 in India. Nokia has also released Nokia N97 Mini which is smaller version of N97 with some changes in specifications. Just use the tools in our site to find more information about these mobile devices.